Join the Kiwi Angler for a fishing experience to remember. Our main fishing area covers Whangaparaoa Peninsula and the Hauraki Gulf. This area covers some of New Zealands best salt water fishing grounds. There is a wide range of fish species targeted in this area with some good sized fish caught regularly. The Kiwi Angler is a well equipped with up-to-date electronics for searching out those elusive fish. 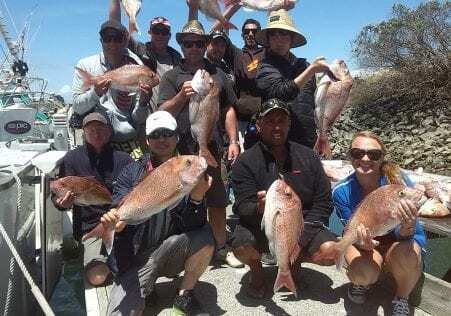 Kiwi Angler comfortably fishes 15 people and can take upto 25 passengers. On the Kiwi Angler we offer everything from individual day excursions, corporate trips to special charters. The boat offers full catering for all trips. We hire all necessary gear and tackle if you require and supply bait at a small fee. Seventy years ago, the writer Zane Grey, dubbed New Zealand an angler’s El Dorado and the country has been proving him right ever since. Here you will find some of the world’s best fresh and saltwater fishing in locations as breathtakingly beautiful as nature has ever devised. In addition to spectacular scenery, you will find yourself fishing in crystal-clear waters for fish that are bigger and wilder than anywhere else. Join the Kiwi Angler for a fishing experience to remember. Cruise out from the Whangaparaoa Peninsula to fish the Hauraki Gulf for some of New Zealand’s best fishing. A purpose built 12.8m launch, the Kiwi Angler is fast and modern, boasting a spacious fishing area with a full walk-around cockpit. It comfortably fishes 15 people and can take up to 25 passengers. This is a great day out for a corporate function, or if it’s a sole charter or casual excursion your are after, we can cater for your needs. 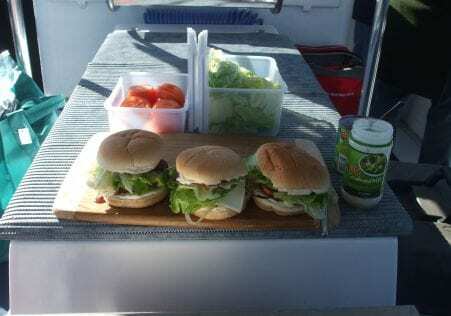 We offer a full catering service and our onboard barbecue means we can serve up lunch while you move on to catching dinner. This is the freshest fish you will ever eat. The Kiwi Angler is well equipped with up-to-date electronics for searching out those elusive fish. While the skipper and crews experience and knowledge of New Zealands fish-filled waters has earned them a catch record envied by many. Well take care of everything. Onboard you can hire quality fishing tackle and the bait is the best you can buy, while an ice-bin is provided to keep your catch fresh. So, if your serious about having a good time and about fishing, call Rex or Lynette Smith to arrange your trip aboard the Kiwi Angler. We will make it one to remember.